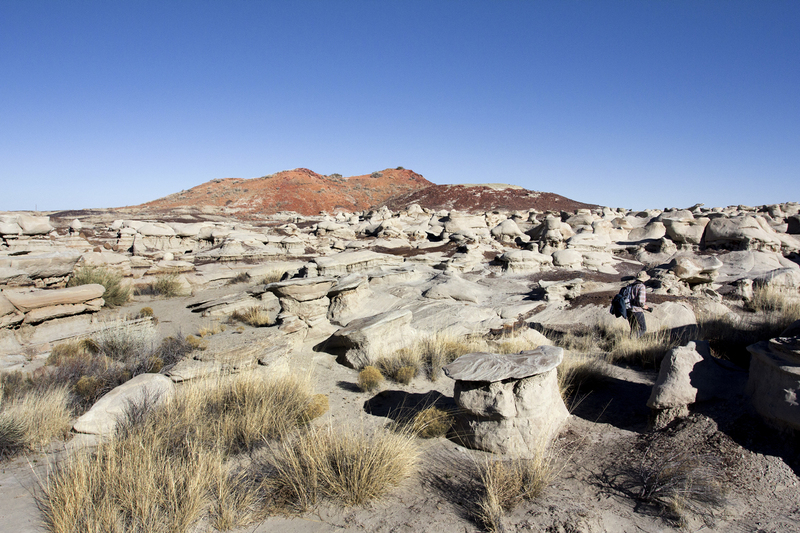 Until very recently, the Bisti and De-Na-Zin Wilderness areas of northwest New Mexico were a locals' secret. 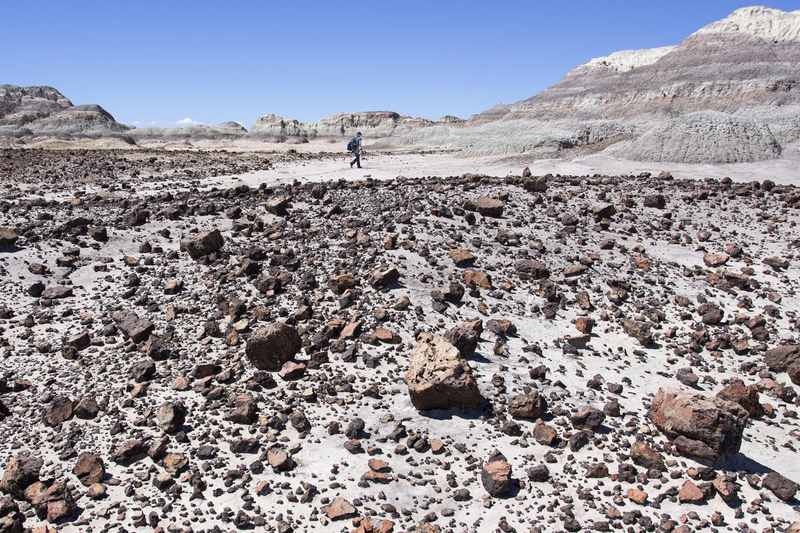 They were miles from anywhere, and you were more likely to see cow than a person when hiking around the 45,000 acres of dramatic and desolate desert. Over the last few years, a few high profile dinosaur finds, some effective marketing, and the internet have come together to increase the area's popularity substantially. A little over 40 miles of patchy highway south of Farmington, New Mexico, you will cross a sea of sagebrush on one side of the road, and the giant irrigated farm fields of the Navajo Agricultural Products Industry (NAPI) on the other, until finally the road drops down and the badlands appear, seemingly out of nowhere. The western side of the wilderness is known as the Bisti, from the Navajo for 'a large area of shale hills.' 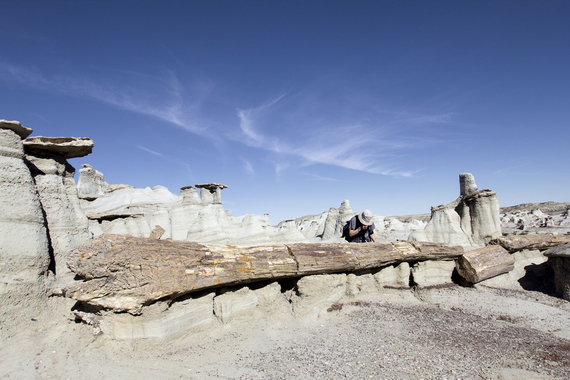 The Bisti is popular with day hikers and photographers, with two easily accessible, though amenity free, trailheads. Follow the southern edge of the wash to see famously unusual formations like the 'Cracked Eggs', and large petrified trees. The far less traveled northern side of the wash offers a dramatic landscape of striped badlands and a little more solitude. Head toward the red hills on your left from the trailhead, and keep going north through them. 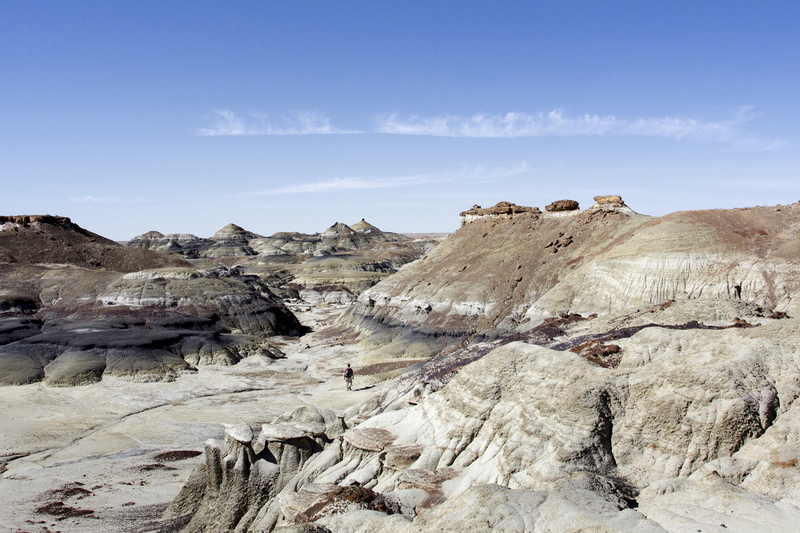 There is an entire day of hiking just behind the hills, in an endless maze of hoodoo gardens, petrified stumps, and colorful mud hills. 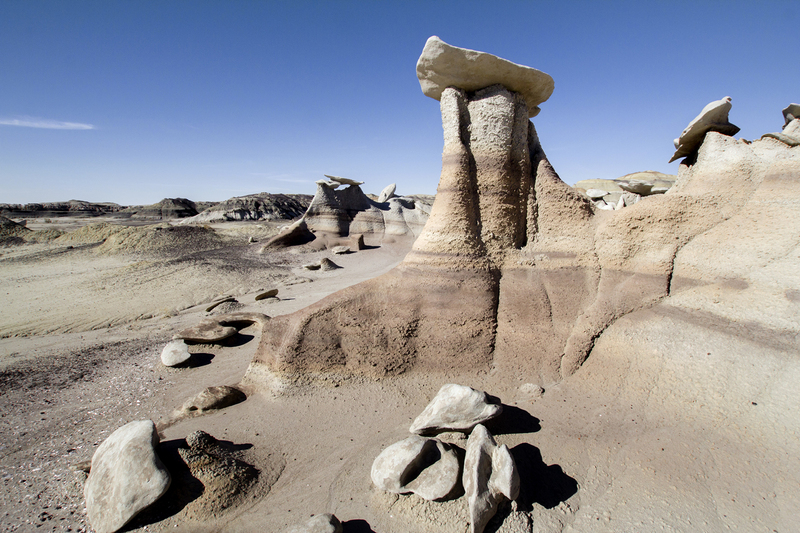 The eastern side of the wilderness, known as the De-Na-Zin, from the Navajo for 'cranes,' has a lower concentration of the dramatic formations found in the Bisti. It more than makes it up with a seemingly endless desert badland solitude. 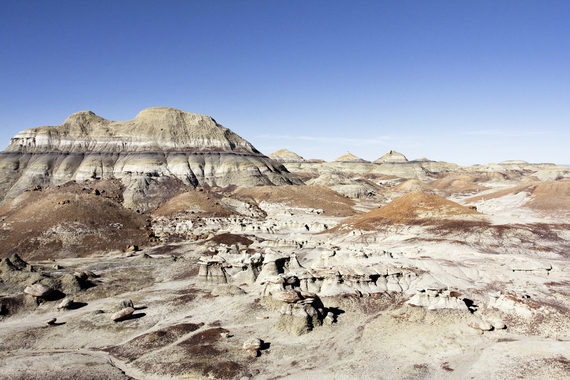 With a more remote trailhead, the eastern side sees only a tiny fraction of the annual visitors who visit the Bisti. 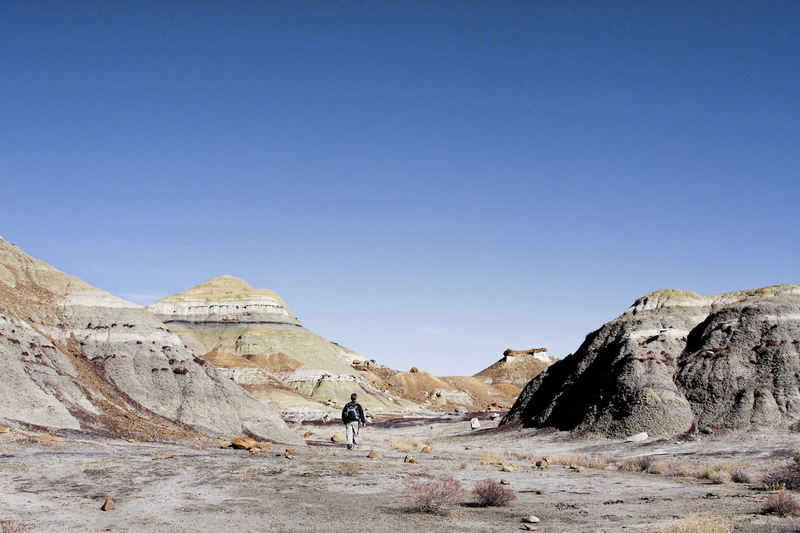 If you go a mile or two from the trailhead in the De-Na-Zin, you are alone in the world. 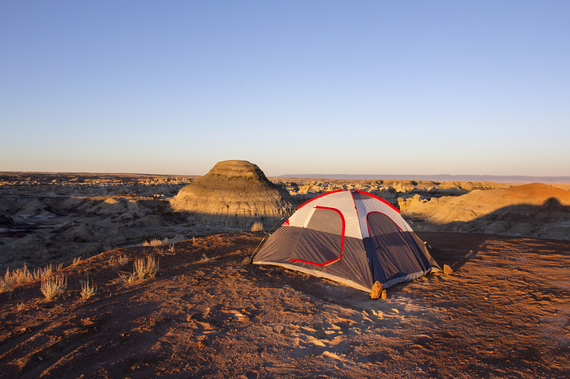 The wilderness is free and open year round, though spring and fall are recommended due to the climate. 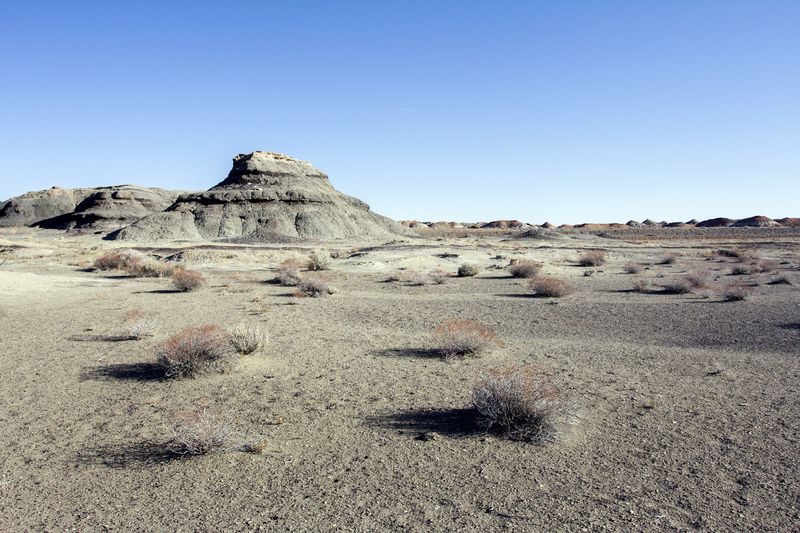 The high desert can get very cold in the winter, and very hot in summer. Camping is allowed, though there are no campgrounds or amenities. All mechanical forms of transportation (including bikes) are prohibited. There are no marked trails; the City of Farmington website offers a good, free, downloadable GPS map, along with tips and informative videos. 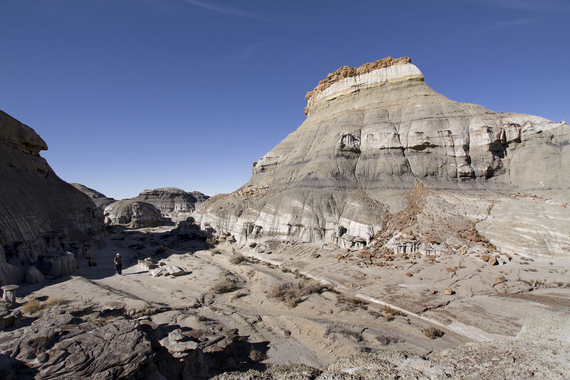 Bisti Traiheads: To reach the Bisti Access Parking Area, drive NM 371 just under 36 miles south of Farmington (from the San Juan River crossing) or just under 45 miles north of Crownpoint, New Mexico (from the intersection of 371 and Navajo Service Route 9), and turn east on Road 7297 (a gravel road). 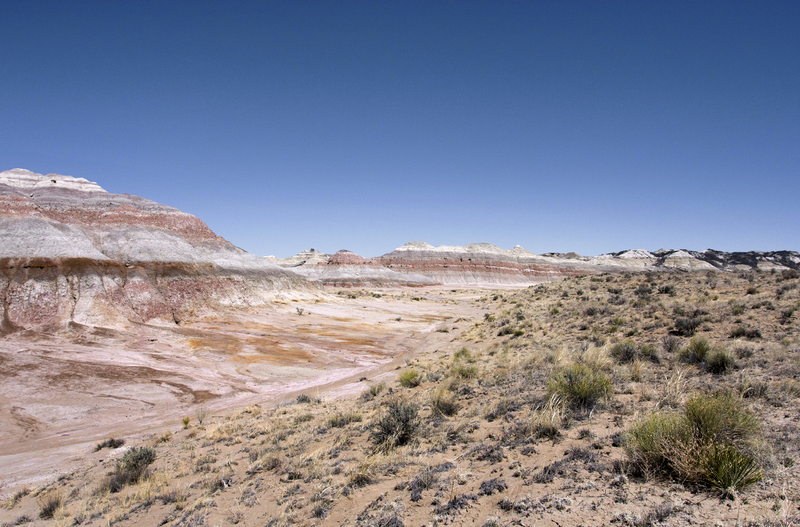 Drive Road 7297 for approximately 2 miles to a T-intersection, and turn left. 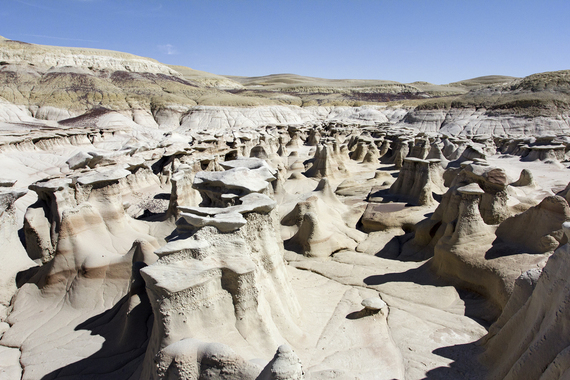 Drive just under one mile to the Bisti Access Parking Area, which is just south of a broad wash on the east side of the road. 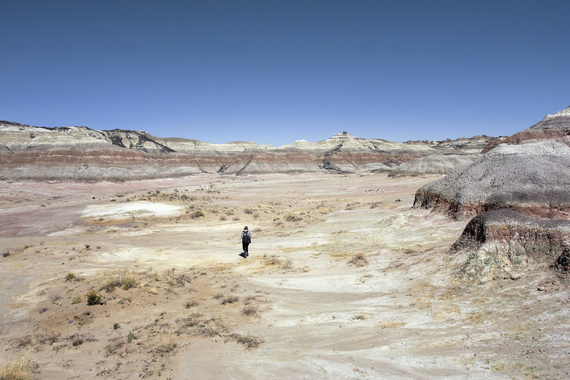 There is another, smaller parking area ¼ mile further north. De-Na-Zin Trailhead: To reach the De-Na-Zin access, drive NM 371 approximately 43¾ miles south of Farmington, New Mexico (from the San Juan River crossing) or approximately 37¼ miles north of Crownpoint, New Mexico (from the intersection of 371 and Navajo Service Route 9), and turn east on County Road 7500. Drive approximately 13¼ miles on Road 7500 to the De-Na-Zin parking area (on the left side of the road). 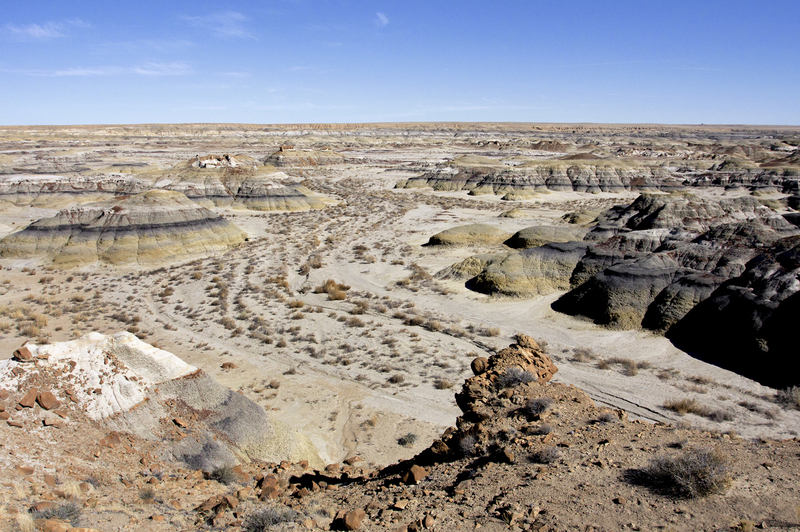 Alternatively, drive US 550, 4 miles north of NM 57, and turn west onto County Road 7500. 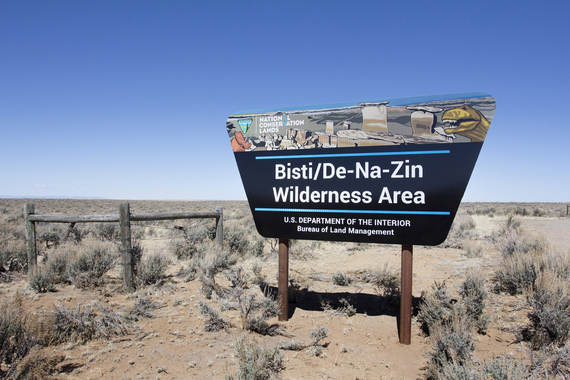 Drive approximately 11¼ miles to the De-Na-Zin parking area (on the right side of the road). 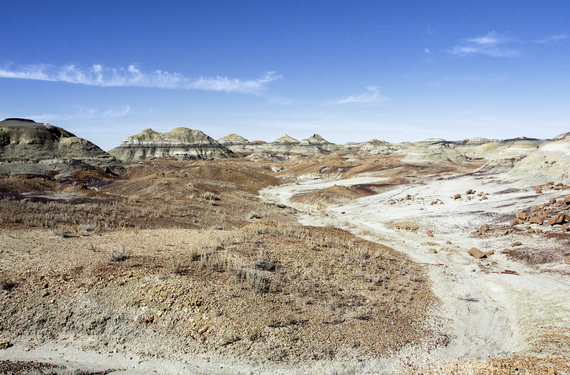 A trail leads from the parking area approximately ¾ mile to the De-Na-Zin Wash, from which visitors walk in many directions to explore.